As I do every year during the week of Thanksgiving, I am posting my blog a few days earlier than usual. I want to begin this week sharing with you a statement I released earlier today on administration’s decision to rescind Temporary Protected Status for more than 50,000 Haitian immigrants currently residing in our country. Thanksgiving is a time to reflect upon the blessings our nation and ourselves and families have received from a generous God, and to renew our commitment, personally and nationally, to share these blessings with all who live in this land. The spirit of gratitude and generosity embodied in Thanksgiving stands in sharp contrast to the decision of the U.S. Government this week to end Temporary Protective Status (TPS) for over 50,000 Haitians living in the United States. TPS is an act of compassion and care designed to assist those whose visas have expired in the United States, and for whom return to their native land is either dangerous or threatening to their lives and welfare. TPS is the kind of political generosity which for decades has earned the United States a positive reputation throughout the international community. The decision made this week to end TPS status for Haitians is unnecessary and unwise. More to the point, it is neither required nor is it morally right. It is true that the U.S. Government has the legal capacity to terminate TPS for Haitians as well as Nicaraguans, Salvadorans and Hondurans living under TPS today. But the United States can and should do far better. As the strongest and wealthiest nation in the Americas we have a moral responsibility to provide care and compassion for our brothers and sisters living here under TPS. An action that would deport thousands of men, women and children to the poorest country in the Americas contradicts the image we hold of ourselves and the leadership we seek to provide for the world. 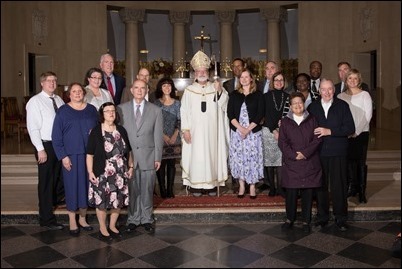 Throughout almost fifty years of religious life and priesthood I have had the privilege to work with immigrants and refugees coming to the United States for protection and for the opportunity for a better life for themselves and their families. 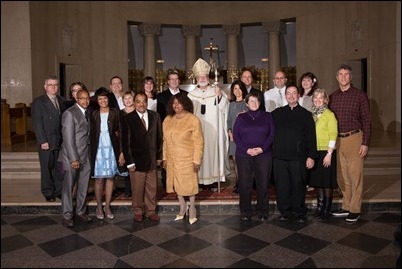 As the Archbishop of Boston it is a blessing for me to be able to continue this ministry. The Boston area has one of the largest Haitian communities in the United States. 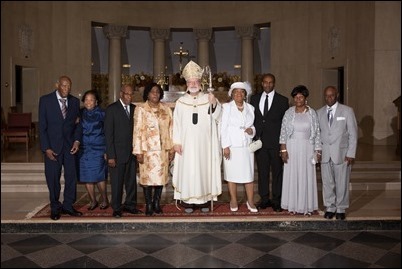 Annually I celebrate the Haitian Independence Day on January 1st by celebrating Mass with the Haitian community. 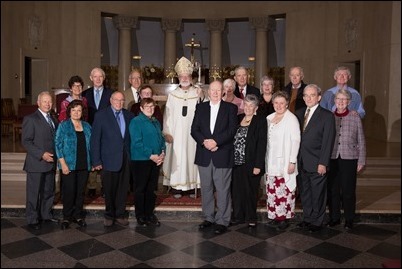 The enthusiasm and spirit of those who have filled the Cathedral of the Holy Cross to capacity reflects the tremendous goodness these individuals and families bring to our local communities. I know in detail what the consequences will be for our Haitian population, including the hundreds of children in our Catholic schools, and others now protected by TPS if that protection is ended. There will be great pain and suffering as families will be separated and children possibly left behind as parents are deported. These dire consequences will not end with deportation: returning to Haiti at this time means going back to a country still struggling to recover from the effects of a massive earthquake, the outbreak of cholera and the recent impact of Hurricane Matthew. The Church in Haiti has described how unrealistic it is to propose that 50,000 people be received and resettled into the devastation and poverty in their land. As a bishop and a pastor, as well as a citizen I am compelled to speak clearly against the current policy of our government in refusing to extend TPS for the Haitian community. It is my hope that the U.S. Congress will work with the Trump Administration to rectify this policy which lacks both wisdom and compassion. 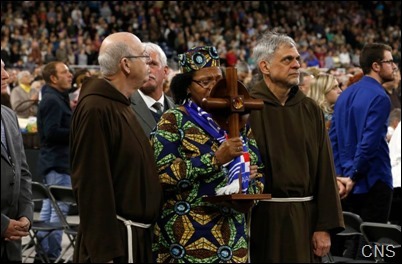 It is my hope that the Catholic community will join other American citizens in calling for a response to our Haitian neighbors that acknowledges both their dignity and our responsibility, a better and more humane response to men and women with families, with jobs which serve our communities, and with the hope to continue their lives in this good and generous nation. 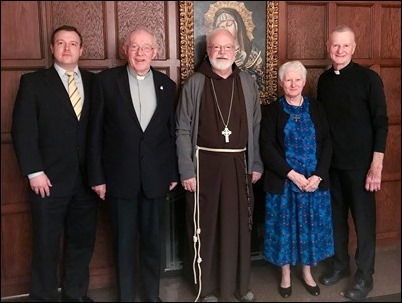 Last Thursday, I was visited by Bishop John Kirby and Brian Hanley of the Irish Episcopal Council for Emigrants, who were accompanied by Father Dan Finn and Sister Marie Prefontaine from the Irish Pastoral Center in Dorchester. 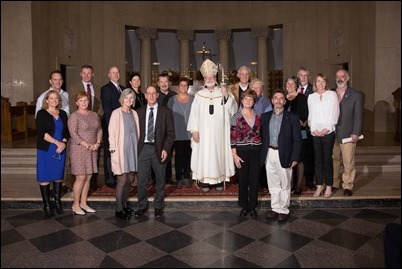 Bishop Kirby was in Boston this week for activities surrounding the 30th anniversary of the IPC, including a special Mass on Saturday which they presented the Papal Order of St. Sylvester to Geri Garvey, a woman with a long history of service to the Irish community in the United States. 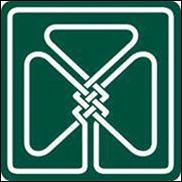 Continuing on the Irish theme, that evening I attended The Ireland Funds’ annual gala dinner at the Westin Hotel in the Seaport District. It was a grand affair with about a thousand people coming out to support the work of this organization that raises millions of dollars each year to fund charitable and community programs in Ireland and also for the Irish diaspora. 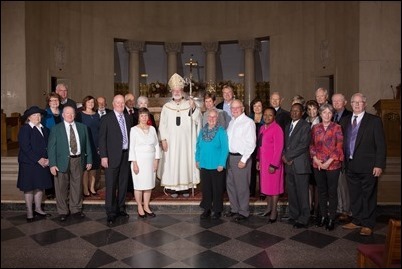 Bishop Kirby was with us for the gala, along with Consul General Fionnuala Quinlan and Irish Ambassador Daniel Mulhall and a host of local business leaders and philanthropists. I was very happy to give the invocation at the dinner at which Peter Lynch was honored for his many contributions to the community. 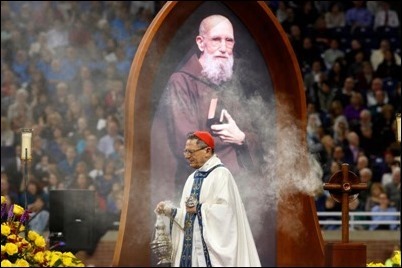 On Friday, I departed for Detroit to be present at the beatification of Father Solanus Casey. 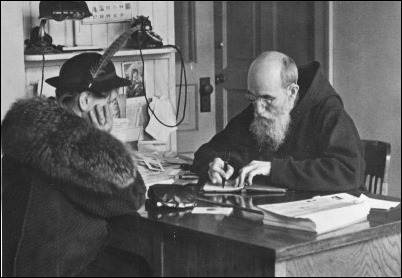 Father Solanus’ parents came to Boston from Ireland in the 1800s. 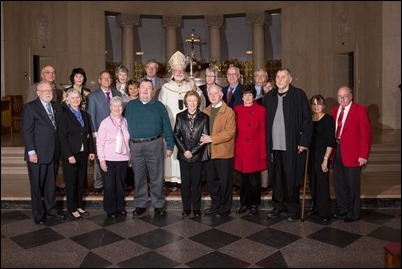 They were married at St. James Church in Salem and then moved on to Wisconsin, where they had 16 children, one of whom was Bernard Casey, who took the name Solanus when he joined the Capuchins. 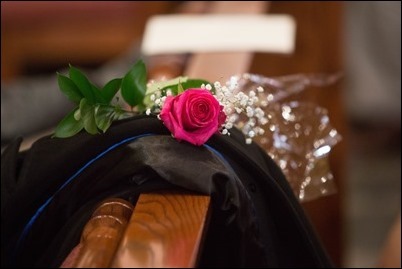 He was ordained in 1904 and served in New York for about 20 years until he was transferred to Detroit, where he ministered for the rest of his days. 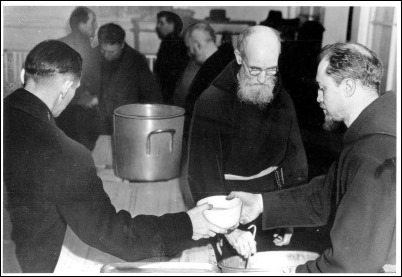 He lived his entire life as a simplex priest, taking care of the poor and working as the porter of the monastery. As the porter, or “doorkeeper,” he would welcome all those who came to the monastery in need — the sick, the poor and the suffering. His whole ministry was one-on-one. He’s very fondly remembered for his work in helping to start a soup kitchen for those in need during the Great Depression. 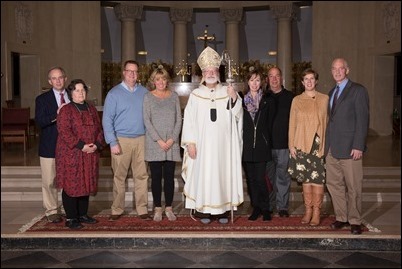 In fact, one of the priests told us that when he was a novice sometimes local farmers had extra crops that they wanted to donate to the food pantry. So, they would send all the friars to the fields to pick the apples or corn, or dig up the potatoes or whatever else they had. That soup kitchen is still in operation, and continues to serve hundreds of people every day. 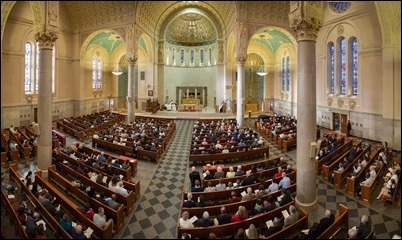 During my time in Detroit, I stayed at the parish of St. Bonaventure, the parish where Father Solanus lived. I was very impressed with the altar of the church. 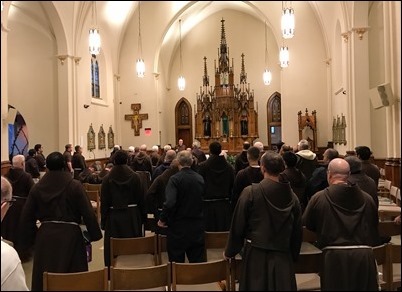 It was a very German community and so, in the style of the Old World Capuchin monasteries, the altar was of unpainted, carved wood in the main church, and behind the altar is a small chapel where the friars pray their office. 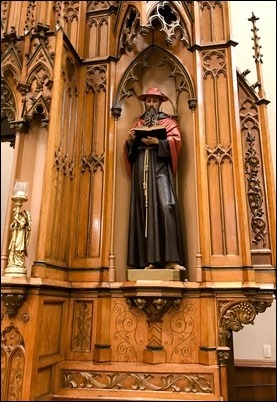 On the altar they have two statues: one of St. Bonaventure, who was a Franciscan Cardinal (and because the founder of the province was named Bonaventure) and another of St. Francis — of course, dressed in a Capuchin habit! 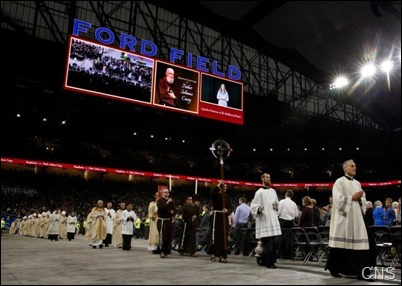 Saturday, was the beatification Mass at Ford Field in Detroit. About 70,000 people came out for this extraordinary event. 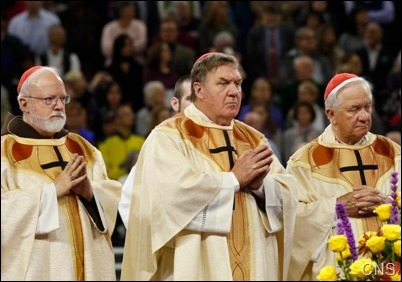 Cardinal Amato, the head of the Vatican Congregation for the Saints, presided, acting in the name of the Holy Father. 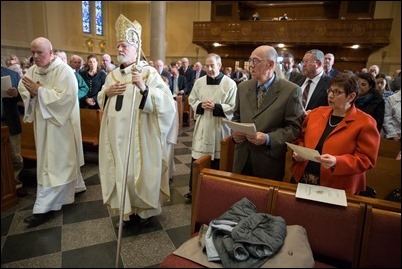 There were many bishops and priests present, as well as about 400 Capuchin friars. 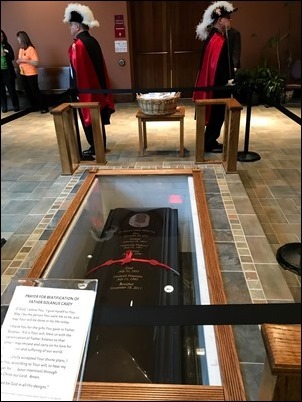 It was a great day for the Capuchin community and for the people of Detroit, where Father Solanus Casey is so revered. 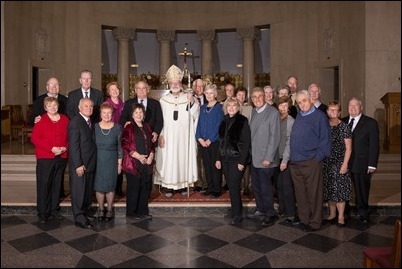 The following day I returned to Boston to celebrate the annual Mass for couples celebrating their 25th and 50th wedding anniversaries, which was held at Holy Name Church in West Roxbury. 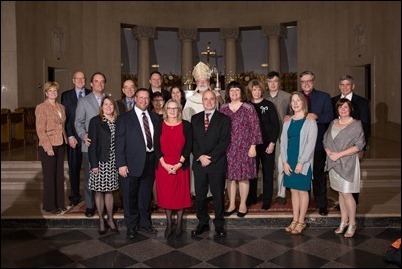 We hold this very important event every year as a moment to celebrate marriage and thank the couples for their fidelity to their vocation and for the witness and testament that they give in today’s world, where the vocation of marriage needs to be held up for our young people to see. 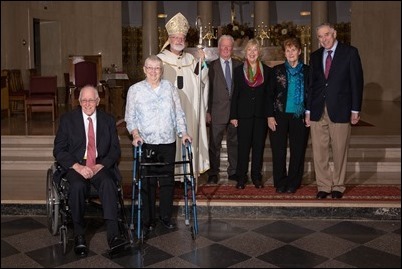 I was pleased to see that among the anniversary couples was Mary and Bob Wilson, the parents of Father Richard Wilson who was my priest secretary in Fall River and who is now the Rector of the Cathedral of St. Mary’s in Fall River. 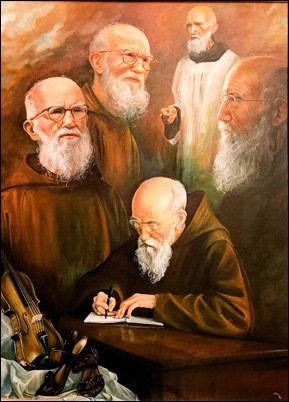 In my homily, I spoke to the people a little about my experience in Detroit, and afterwards, as we were taking pictures, many people produced holy cards of Father Solanus that they carry in their wallets. 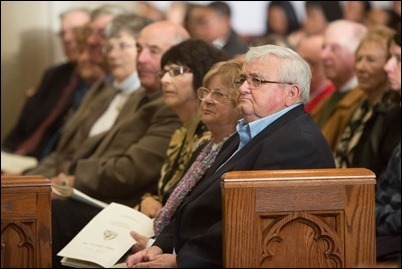 I was very touched at seeing how widespread the devotion is to this newly beatified friar. 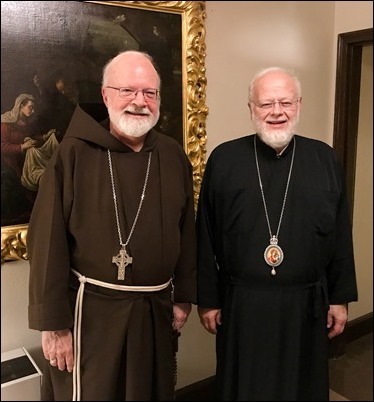 That evening, back at the Cathedral, I had dinner with Metropolitan Methodios and Father Ted Barbas of the Greek Orthodox Metropolis of Boston. It was a chance to greet the Metropolitan and catch up on some of the different happenings in our communities. I was also pleased to be able to tell him that the Metropolitan of Detroit was present at the beatification of Father Solanus. Finally, I want to wish everyone a very blessed Thanksgiving! 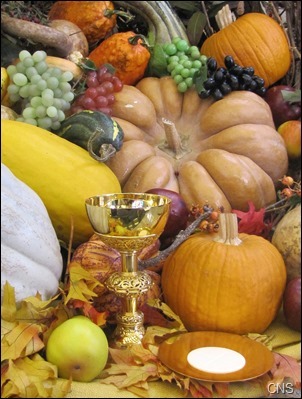 Even though its origins may be secular, Thanksgiving is a recognition of the fact that everything we have, and everything we are, is a gift from our loving and merciful God. A beautiful way of celebrating this is for families to come together to show appreciation for each other and for the many blessings that God has given to us individually, in our communities, and in our nation.